This brief little article suggests that someone having difficulty sleeping might think of a previous dream and go “over and over the scene it presented” to induce sleep. This is the subject of Chapter 6 Chasing Hypnos, pages 67-80. In that chapter, I recommend documenting five dreams and reading over them before bed. Then if you have difficulty getting to sleep initially or back to sleep after waking during the night, that you can use those five dreams to assist you getting to sleep. Of course, I also appropriate Hypnos, Greek God of Sleep, and Hermes, Guide of Souls in the Underworld, as aids with this. The article also confirms my experience that, “counting numbers or repeating easy-flowing verses” frequently fails. Of course, In Pursuit of Sleep does suggest (Chapter 5 Controlling Your Psychic Voice) that poems can be used to augment the Transition Trek, but that is completely different from requiring the poem go it alone. 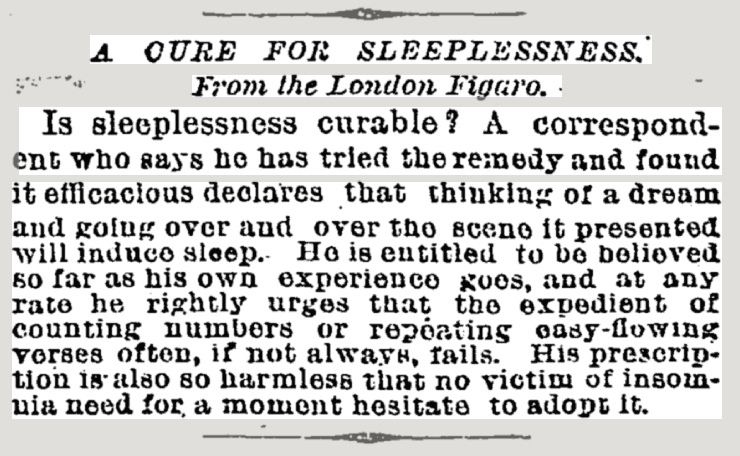 Anyway, interesting voice from the past with a couple of interesting thoughts on insomnia.